A number of differences have been noted between the repair of fetal and adult wounds. Scanning electron and confocal microscopy studies on amputated embryonic mouse (11.5 days of gestation) hindlimb buds in vitro indicated that re-epithelialization is complete by 24 hr (McCluskey and Martin, 1995). Re-epithelializa-tion occurs not by lamellipodal crawling (migration) of cells as in the adult, but by a purse-string contraction of a filamentous actin cable assembled in the basal layer of cells at the edges of the wound. Observations on DiI-labeled mesenchymal cells revealed that the mes-enchymal edge of the wound moves inward by 50% within 24 hr. This movement is not due to the conversion of mesenchymal cells to myofibroblasts and contraction as in adults, however, but to the active movement of the cells over the ECM substrate (Mast et al., 1997). Ihara and Motobayashi (1992) reported similar findings for wounded fetal rat skin. Collagen and noncollagen protein synthesis are both elevated above normal in fetal and adult rat wounds. However, the ratio of collagen/total protein in wounded adult skin is higher than in unwounded adult skin, whereas there is no significant difference in the collagen/total protein ratio between wounded and unwounded fetal skin (Houghton et al., 1996). The fibroblasts of the fetal wound synthesize the same collagens as fibroblasts in the adult wound but there is no excessive deposition of type I collagen fibrils in fetal wounds and the fibrils are organized in the basket-weave pattern of normal dermis (Frantz et al., 1992; Mast et al., 1997). This normal pattern of collagen synthesis and architecture is associated with three other differences from adult wounds in ECM synthesis. First, fetal wound fibroblasts synthesize higher levels of HA and HA receptor (DePalma et al., 1989; Longaker et al., 1989; Alaish et al., 1993), giving them more opportunity to bind HA and thus for cell movement. HA has been shown to inhibit fetal fibroblast proliferation (Mast et al., 1993) and to decrease scar formation in wounds of adult tympanic membranes (Hellstrom and Laurent, 1987). Conversely, treatment of fetal rabbit skin wounds with hyaluronidase or HA degradation products alters the regenerative response toward fibrosis (Mast et al., 1991, 1995). Second, sulfated PG synthesis does not accompany collagen synthesis in fetal wounds (Whitby and Ferguson, 1992). 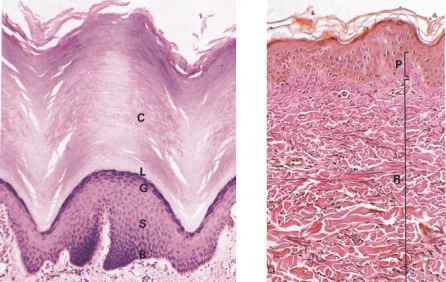 Third, fetal skin has a higher ratio of type III to type I collagen (Epstein, 1974; Merkel et al., 1988).